English translations (from the Chinese scanlations). – Nice to have a new, unannounced color page, and featuring Hana! It’s kinda rare Tsubasa color pages featuring characters outside of the main cast. At first, however, I thought the coloring was done by the Chinese scanlation team. The coloring looks rather… bland? Yes, this was a criticism. – I wonder if we’ll be getting at least one color page each month. That would be neat. There is also a color page planned for the next chapter. – Are they referring to Hana as “hime” (princess) in the original Japanese version? Since Hana is genderless, I wonder how “she” will be presented in Tsubasa. – The scene with the Sakura flower -> just a reminder to all readers that there is another very important princess somewhere else. – It’s interesting when you see the parallels between Kurogane and Tachibana, and Fye and Sakura. Although their personalities are similar, I find it strange that in Tsubasa I like Fye more than I like Kurogane but in GATE 7, I like Tachibana more than I like Sakura. That feels odd seeing how CLAMP see them as having similar personalities. – Do I see a Shonen Magazine with Kurogane’s muse, Primera, on the cover? – Fye doesn’t like pickles. Yes, I remember why I like Fye now. – My friend Sakura-chan pointed out that the two beasts are probably a reference of the Okinawan mythology Shisa. 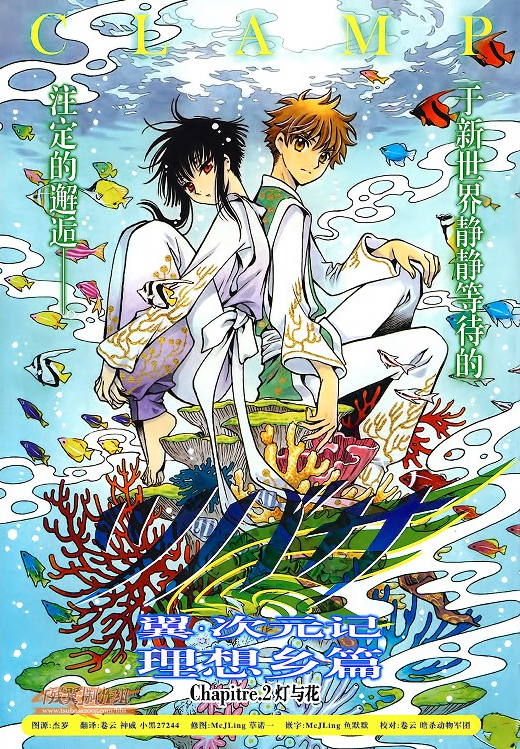 You might all remember how CLAMP traveled to Okinawa earlier this year (or was it last year? ), so I do support this theory, also. – What is it that Syaoran sees? Seems like a weird dark-looking tree? But the sky looks weird too. Maybe Nirai Kanai isn’t such an ideal village after all? – 34 pages this month (72 pages so far for volume 1), not much development in this chapter. And call me picky but I thought the art didn’t look that good in this chapter. Yes I did 😉 I wante d to like you post but for some strange reason, I couldn’t. Oh noes, you missed them by a bit! Dreams tend to take great significance in the works of Clamp, so it probably means that Syaoran will have a chance to grant his wish soon. You think the flow is faster? I think it’s slower ^^” but I don’t think Sakura has anything to do with it being slow or fast. I haven’t seen Japanese raws around =/ I don’t know what’s going on. I guess people are afraid to share japanese raws since the Japanese law became more severe for those sharing scans.